First year baby portraits are such a great idea if you want your baby captured as she changes so much her first year of life. 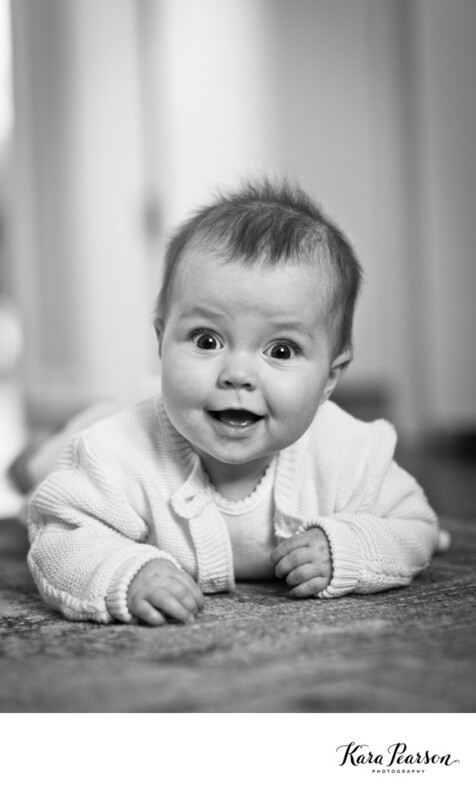 Generally, I photograph babies as a newborn, at the 6-7 month stage when they are sitting up and giggling, and then again at a year. Sometimes that year session can be at their first birthday party, and sometimes parents just want a true portrait session. This beautiful baby is six months old and is just learning to sit on her own. Her smile is infectious and how could you not want to capture that forever?! Baby portraits in Denver can be taken outside, in studio or at your home. I love in-home sessions because it's so personal. Your house holds so many memories and those memories become more dear to you the older your baby gets. Allowing your baby to act like a baby is the best thing you can do. If they cry, pout, get sleepy - it's okay! There are some really sweet moments there that I love to capture. It's not always about the smiley, giggly photo (although those are cute!). I love me some snuggley portraits as well. First year baby portraits are the best option to capture all the fun baby stages.